"I have purchased a large amount of movies and TV Shows from iTunes Store, but it is impossible to play them on Plex, why? Is there any solution?" Have you ever met with the similar problem and want to find an answer, the article can help you well. All the iTunes purchased videos including TV shows, movies and music videos are protected by Apple Fairplay DRM protection, which stop users playing them on non-Apple products, even you want to play iTunes videos on iPad, iPhone or Computer, you need to authorize them before you play. To play iTunes video to Plex madia server freely, removing DRM from the purchased TV shows is necessary. M4V Converter Plus does well in stripping any DRM from protected videos. It works well in converting any iTunes purchased or rent movies, TV shows and music video with 30X faster speed and excellent output quality. Remove DRM protecion from iTunes purchased videos and iTunes Rentals. Convert DRM M4V to standard video or audio formats at 30X faster conversion speed. Crop big iTunes videos into small segments before convert. Play iTunes videos on Plex, VLC media player, common android smartphone, game console and more. With multi-language audio tracks (including 5.1 audio track)and Subtitles kept. Step 1. 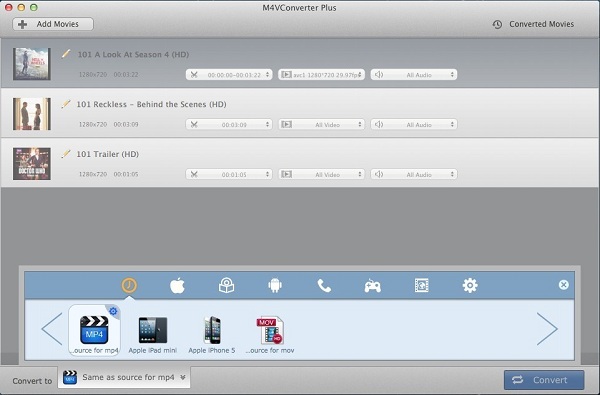 Free download and install M4V Converter Plus on your Mac. The program is compatible with Mac OS X 10.8, 10.9, 10.10 and macos sierra well. When you launch it and iTunes will open automatically at the same time. Step 2. Add iTunes media files to the program. 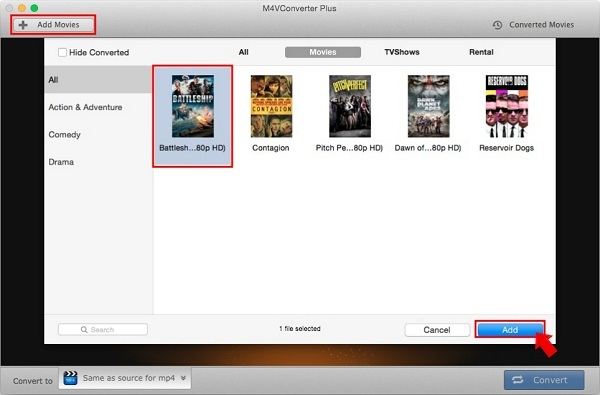 To import iTunes video to the program, you can click Add Movies button, or click File --> Add Files from main menu-bar. 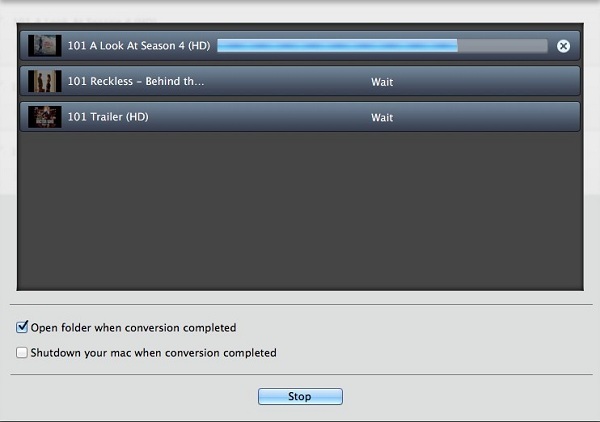 This program supports batch conversion, allowing you to import several iTunes video files at the meantime. Step 3. Find a suitable output format for Plex. This step will help you choose the right format for Plex media Server. It supports various audio and video formats, including MP4, MOV, AVI, MPEG, etc. So here we can select Same as source MP4 from Convert to profile list as the output format. Step 4. Start converting iTunes videos to Plex. Finally, you can click Convert button to start converting M4V to MP4 progress. After conversion, now you can play iTunes videos via Plex freely. And there is no need to worry about the video player devices, if you can open plex, you can watch it. So easy it is. 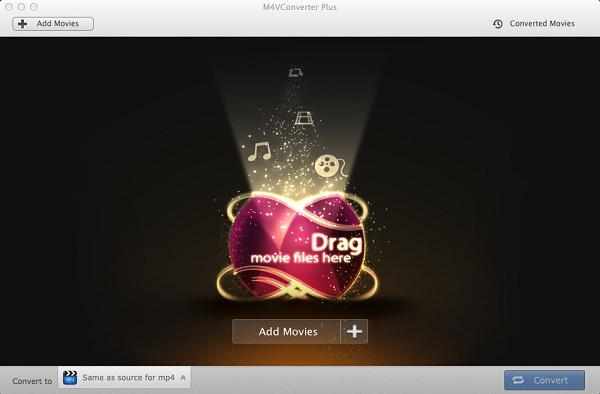 To know M4V Converter Plus better, you can free download the trial version and take a try. Plex organizes video, music and photos from personal media libraries and streams them to smart TVs, streaming boxes and mobile devices. It is a media player system and software suite consisting of many player applications for 10-foot user interfaces and an associated media server that organizes personal media stored on local devices. It is available for Windows, Linux, OS X and FreeBSD. Sign up for your free account and download the Plex Media Server software, the central brain that organizes all of your media. In this way, you can play iTunes protected videos via plex media server freely. 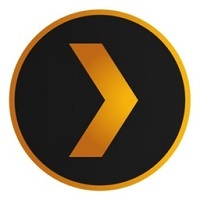 See the Plex tutorial: Direct stream and play videos on Plex.